Metrodata ATM Network Termination Units are a 2-port ATM switch which performs interface conversion and ATM service demarcation functions. 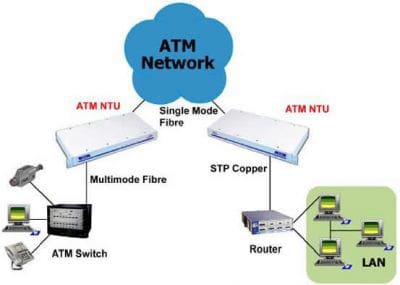 The Metrodata ATM Network Termination Unit (NTU) provides a media conversion and ATM service demarcation function for STM-1/OC-3 ATM services. A wide variety of copper and fibre interface types are supported which mean that these services can be installed with whatever is the most suitable cabling, and offer the exact interface required by the user thereby minimising installation costs. The ATM NTU has two different ATM interfaces. Cell traffic received at these interfaces is analysed for errors, idle cells are deleted and valid traffic is then forwarded to the ATM cell buffer. When bandwidth is available traffic is extracted from the ATM cell buffer and transmitted out of the other interface. If the ATM cell buffer becomes full, then cells are discarded until space becomes available. If there is no traffic queued, the DSU transmits idle cells in lieu of traffic. The ATM NTU has built in diagnostic loops which segment the link and assist in locating device, cabling or network faults. Extensive performance monitoring statistics are also gathered and stored for 24 hours. This provides a substantial database for assessing the performance of the network, which can be used to identify alarms, errors or data loss. Front panel LEDs also give indication of major and minor alarms.